Our previous Stock Exchange asked the question: How do long-term fundamentals impact your near-term trading thesis? As an example, we compared the near-term technical strength of monthly dividend REIT, Realty Income (O) to its long-term fundamental valuation. When they’re aligned, that’s one thing, but when they’re opposed that’s something entirely different. This Week: Who Moved My Cheese? 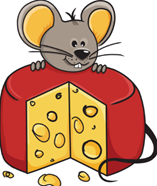 As you may recall, Who Moved My Cheese was a popular business fable published in 1998 that remained on the New York Times business best seller list for almost 5 years. It was basically a parable about how to thrive in a world of change an uncertainty, as told through a tale of two mice (Sniff and Scurry) and two humans (Hem and Haw) living in a maze and constantly searching for cheese. And there’s an important takeaway for traders to learn, mainly that instead of constantly hemming and hawing about how the market is supposed to behave, successful traders can offer sniff and scurry their way into learning new things and adapting to find success in a constantly changing marketplace.